NCAA basketball news - Who will be playing basketball later in March? All the basketball news sports services in the USA are focused in college hoops results as March Madness is under way. There are a number of French players involved in NCAA Division 1 basketball on whom we restrict the rest of the article. During the first two weeks of March most of the conferences have a post-season tournament in which the winner automatically qualifies for the NCAA Tournament also known as the "BIG DANCE". This leads to a complicated system in determining the final field of 64 teams. Once done the brackets are set and it is a knock-out competition all the way from the first round, second round, Sweet 16, Elite 8 and Final 4. The WNIT (Women's National Invitation Tournament) is the second tournament for 128 teams that have missed out on the conference title and are not invited into the NCAA tournament. Apart from the juniors from France there are other French based and French players playing college hoops who hope to take part in one of the two big tournaments starting later this month. 1: Christelle Akon-Akech who was a member of the France U16 squad with the 1991 generation left France to complete her High School education at Blair Academy. 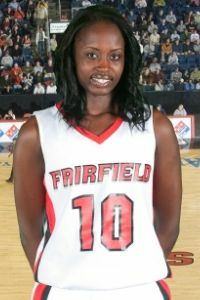 Today she is a Sophomore (2nd year student) at Fairfield University and a member of the Stags Basketball team. Her team finished second in the Metro Atlantic Athletic Conference (MAAC) and also finished second in the tournament. This means that her school has an automatic bid for the WNIT. Akon-Akechi has played in 29 of the 32 games so far this season. 2: Tamzin Barroilhet's season with Kent State has come to an end with her team's elimination in the Mid-American Conference (MAC) during the Tournament's First Round. Barroilet started all 27 games this season. 3: Katrin Chiemeka and the Davidson Wildcats were eliminated in the semi-final of the Southern Conference (SOCON). But the season continues with an automatic bid for the WNIT as regular season champions. Chiemeka has played in all 31 games so far starting in 29. 4: Freshman Nina Déal: She spent the last three years at Bourges Basket and also attended several training camps with French youth teams but was not selected for any European or World Championship team. Before coming to Bourges in 2008-2009, she made a name for herself while playing for FC Lyon. She is attending Deleware University which participates in the CAA conference. The Blue Hens have just lost once this season and won their conference title with an 18-0 record. The CAA tournament does not start until the 8 March. However as number 1 seeds and their national ranking Deleware University will be at the Big Dance. Déal has only appeared in three games so far this season. 5: Freshman's Romane Dessacs decision for NCAA basketball came very late. She just beat the deadline to qualify for admission this year. She attends Robert Morris University and is a member of the Colonials basketball team. She has participated in 24 of the 30 games played so far averaging 7 minutes per game. Dessacs who has spent most of her playing career with Toulouse has been in the starting line-up three times. Robert Morris finished fourth in the North East Conference (NEC) during the regular season and must win the NEC play-off championship to qualify for a NCAA tournament. At the time of writing this article Robert Morris have qualified for a conference semi-final match against number 1 seeds. 6: Melisa Mendes is a senior from France that has not featured much in international basketball news and is in her first and last season at UTEP. She went to junior college Northwest Florida State College before joining UTEP this year. The UTEP Miners have already clinched the Conference USA regular season championship (C-USA) and are guaranteed an automatic bid for the WNIT. The conference tournament starts later this week and if they win then they go to the Big Dance. Mendes has played in 27 of the 29 games played so far starting in 9 games. 7: Has Najat Ouardad's season actually ended is the big question. Auburn University finished 9th in their conference which leaves them in first position for a WNIT automatic bid if the 8 schools above them are invited to the NCAA tournament. Aubern's last game ended in defeat in the first round of the SEC tournament and also brought to an end the reign of Head Coach Nell Fortner. You can listen to Ouardad speaking about this in the video. Ouardad has played in all 30 games this year starting 18 times. 8: Freshman Manon Pellet who played for Lattes Montpellier last season has had to red shirt this year due to an ACL injury. She is currently attending classes at Rider University while undergoing rehabilitation. 9: Pellets team-mate from Montpellier Mathilde Hergott who signed for the University of Texas at San Antonio (UTSA) had also had to red shirt this year. 10: Allison Vernerey and Duke more or less secured their NCAA place by winning the All-Atlantic Coast Conference (ACC) regular season title. So despite losing their ACC tournament crown after a quarter-final elimination Vernerey is off to her third Big Dance. In the meanwhile the GO Duke Basketball news information department released the news of another academic accolade for Vernerey who has played in all 29 games this year starting once.